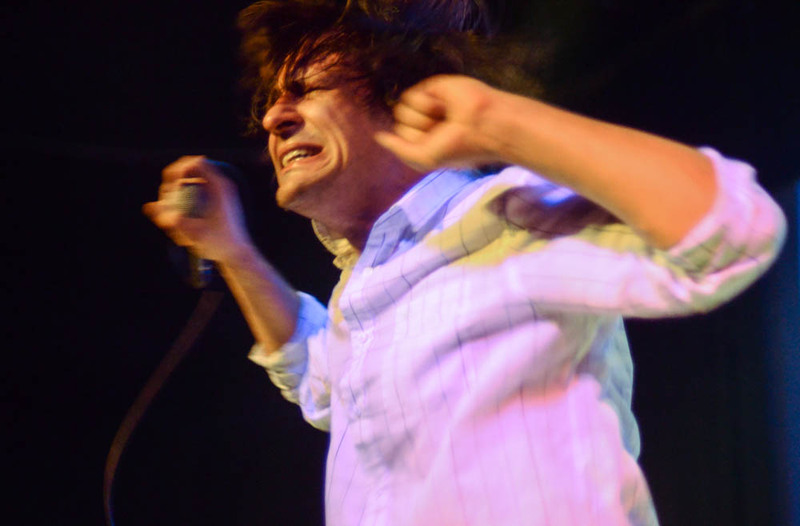 Having seen John Maus live before, his math-professor-on-crystal-meth routine wasn’t as shocking as that first time in the 7th Street Entry many years back, but it still was jarring and wildly entertaining. Unlike his last set, which featured just pipped in music behind his arm flailing and contorted facial expressions, this time the electro-pop songsmith had a three-piece band backing him up. The live drums, bass and synths added an interesting layer to the stage, but untimely the show had a singular focus. I haven’t dove as deep into Maus’s new album as I had with his outstanding 2011 LP We Must Become the Pitiless Censors of Ourselves (how the hell has it been seven years?! ), so I was pleasantly surprised when he spent a good chunk of the evening dipping back into that album, starting with the opening number “Streetlight.” Between tracks from his new album, he also hit on favorites “..And the rain,” “Quantum Leap,” and set closer “Believer.” While the new material didn’t resonate as much with me because I didn’t have as deep of exposure to it, it still held up next to songs from what I still find to be some of the most interesting outside pop music of the last 10 years. While it is nearly impossible to reconcile his sharp, polished song craft with the madcap performance artist on stage, I actually don’t feel like one persona overwhelms the other. In fact his stage pretense only serves to expand on the intensity of his music and create an atmosphere that makes the somewhat brittle songs feel almost like shadowy anthems. The crowd welcomed back the long-lost Minnesota kid into a very sold out Cedar Cultural Center, and while some seem mystified by his stage antics, most seemed enthusiastic following his short but punchy performance. I wasn’t sure if the second time seeing Maus was going to feel like a letdown, especially with my lack of knowledge about his new material, but he didn’t disappoint. Maybe it was the long time between albums and shows that kept the feeling fresh, but whatever it was I left the Cedar hoping it isn’t another half decade before I saw him stalk a stage again.